Talk about a comeback story: A tiny NASA satellite once teetering on failure has successfully unfurled its solar sail while orbiting the Earth, the space agency announced today (Jan. 21). The NanoSail-D satellite — which ejected from its mothership just this week, more than a month late — deployed its sail at about 10 p.m. EST yesterday (Jan. 20; 0300 GMT on Jan. 21) and is operating as planned. The unfurling marks the first time a NASA craft has ever opened a solar sail in low-Earth orbit, according to agency officials. NanoSail-D, whose core is only the size of a loaf of bread, sent data home indicating that deployment of its 100-square-foot polymer sail had occurred. Ground-based satellite tracking efforts further confirmed the success, officials said. "This is tremendous news and the first time NASA has deployed a solar sail in low-Earth orbit," said Dean Alhorn, NanoSail-D principal investigator and an aerospace engineer at Marshall Space Flight Center in Huntsville, Ala., in a statement. NASA has asked for help in tracking NanoSail-D from the amateur ham-radio community, and the so-called "hams" delivered. "To get to this point is an incredible accomplishment for our small team and I can't thank the amateur ham operator community enough for their help in tracking NanoSail-D," Alhorn said. "Their assistance was invaluable. In particular, the Marshall Amateur Radio Club was the very first to hear the radio beacon. It was exciting!" While NanoSail-D is NASA's first big solar sail success, it's not the first craft to demonstrate the technology in space. In June 2010, Japan's Ikaros probe deployed its solar sail, becoming the first craft to cruise through space propelled only by sunlight. 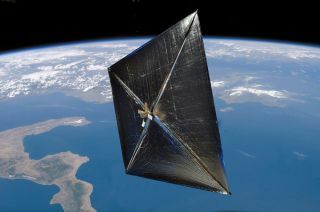 NASA launched the NanoSail-D solar sail on Nov. 19 from Kodiak Island, Alaska. It was one of six different scientific payloads aboard a larger satellite called FASTSAT, which is about the size of a washing machine. On Dec. 6, NASA engineers triggered the ejection of NanoSail-D from FASTSAT. But it apparently didn't work. Yet on Wednesday (Jan. 19), NASA announced that the little solar sail satellite had spontaneously popped out on its own and was flying free in space. When it ejected, NanoSail-D initiated a three-day countdown to unfurl its polymer sail, and that countdown hit zero last night. Four booms deployed, unfolding the nanosatellite's sail within 5 seconds. NanoSail-D's comeback is also a validation for the new, and potentially cost-saving, techniques involved in ejecting a nanosatellite from a mothership microsatellite like FASTSAT, researchers said. "This is a significant accomplishment for both the FASTSAT and NanoSail-D projects," said Mark Boudreaux, FASTSAT project manager at Marshall. "This accomplishment validates that we've met another of our primary mission objectives -- successfully ejecting a nanosatellite from an orbiting microsatellite." The NanoSail-D solar sail craft in space is actually the second one NASA has tried to put in orbit. The first NanoSail-D was destroyed when its rocket vehicle failed during launch in 2008, NASA officials said. The little satellite should keep sailing through space in low-Earth orbit for the next 70 to 120 days, depending on atmospheric conditions, officials said. At the end of this time, it will burn up in Earth's atmosphere. NanoSail-D will continue to send out beacon signals, which can be found at 437.270 MHz, until the craft's onboard batteries are expended, NASA officials said.